The kids are back in school in Charlotte and having the right learning resources at your fingertips is a big deal. Libraries always have plenty of books, but they also offer learning services. The Charlotte Mecklenburg Library is known for offering some of the best learning resources for children. Here's a look at the top choices by age range. Active Reading Workshops - Perfect for the youngest of children, the active reading workshops including reading a book with the child instead of reading it to them. This helps children to develop vocabulary language skills and more. TumbleBooks - A great choice for your children, this collection of talking picture books offers books in French and Spanish, along with English. Children can enjoy nonfiction books, puzzles, games, graphic novels, and language learning. Get Set 4 K - If your child will be going into kindergarten soon, this month-by-month guide will help get them ready. It includes activities to do with your children, books to read together and plenty of tips. Charlotte is filled with amazing neighborhoods and places to call home. From Uptown to the South End, you can choose from several amazing neighborhoods throughout the city. However, the Greater Charlotte Area also offers plenty of great towns with real Main Streets. If you prefer the feel of a small town over an urban neighborhood, you're in luck. You can have your cake and eat it, too, when you choose one of the towns near Charlotte. Living close enough to enjoy big city amenities, while keeping the small town feel like a part of your home gives you the best of both worlds. When you start shopping for a home in one of the Charlotte suburbs, you might be surprised at what you find. Wide sidewalks, ice cream shops, coffee cafes, fine dining restaurants and plenty of shopping will likely greet you in these downtown havens. Here are five the very best towns near Charlotte with a real Main Street. Maybe the best suburb of Charlotte and certainly one of the top downtown areas, Matthews has so much to offer. It's filled with great places to shop, dining and plenty of entertainment. The Main Street is found right next to Stumptown Park, which is known for excellent events all year long. You can enjoy festivals and movies on the lawn as this park, along with the Food Truck Fridays event held every week. If you want one of the very best downtown areas and Main Streets in the Charlotte area, your next home needs to be in Matthews. It's a vibrant town to call home with plenty to offer for all types of residents. If you're an entrepreneur, relocating to Charlotte may just be the right move. It was recently named by WalletHub as one of the best large cities to start a business. After surveying 180 U.S. Cities WalletHub came to the conclusion that Charlotte belonged high on this list. The list was compiled based on 19 different key metrics. The metrics even included the five-year survival rate for businesses and the affordability of office space. Here's why Charlotte made it onto this list from WalletHub. Charlotte landed in the 9th spot, which was better every other city in North Carolina, except Durham. The city was ranked as the 23rd best Business Environment, 43rd for Access to Resources and 56th for Business Costs. Even though the United States is a pretty young country, North Carolina is home to some of the oldest places found in the country. Charlotte offers several historic attractions and historic homes all throughout. Some may see these as just old houses, but others see them as the perfect dream home. If you love the idea of living in one of the historic homes in Charlotte, you should know what you're getting into first. There are several things to understand from historical designations to local laws to preservation regulations. Here's a look at five of the things you should know before you buy a historic home in Charlotte. The National Register of Historic Places will become something you get very familiar with if you're searching for a historic home in Charlotte. Whether you're looking in Myer's Park, Dilworth or Plaza Midwood, you will need to understand how the NRHP works. The NRHP works with the local government in Charlotte to designate and help regulate buildings, historic districts, and landmarks. They make recommendations and the local government will make the final decision about how to control and protect historic areas throughout the city. In Charlotte, most of the historical sites have already been names as historic landmarks. However, the city can ask the NRHP to make a district, building or landmark a historical place, but it's not the easiest process in the world. When you're considering buying a home in a Charlotte golf course community, there are some things you need to know first. Golf is a very popular sport with more than 25 million people in the United States playing every year. Even those that don't play golf may prefer to live on a golf course. When you start considering homes for sale in golf course communities, you need to know what to look for. It's obvious that you will want to be on a good course, but there are other things to consider, as well. Here are some of the top questions you should ask if you want to live on a Charlotte golf course. You may not think about this right from the get-go, but it's an important question. Often, private courses are funded by country club dues, but a public course may depend on foot traffic from golfers to survive. It's important to know the financial situation for the course, as a course struggling to survive could have a negative impact on your property values if it shuts down. An HOA means you will have to pay dues, which isn't that big of a deal, but something you should consider. Most golf course communities will have higher dues than other neighborhoods to cover amenities, such as the on-site restaurant, course, and clubhouse. They could also be used to help cover infrastructure and other neighborhood necessities. Is the Community Still Under Construction? It's not that big of a deal if a community isn't finished yet, but it's still something you should know. You should understand the phases they will be building in and consider the construction in your decision. How Old is the Community? Which Charlotte Neighborhoods are the Most Bike-Friendly? Charlotte is filled with bike-friendly neighborhoods. While the city itself isn't the most bike-friendly on the planet, it's working on becoming more bike-friendly. With a new bike-sharing system, several new trails and many neighborhoods becoming far more bike-friendly, it's getting better and better every year. If you love the idea of traveling to work on your bike or you just love to ride, you need to know which Charlotte neighborhoods are the most bike-friendly. Here's a look at a few of the top choices for those looking to enjoy their bike regularly. It's actually a city, but a suburb of Charlotte. While you won't be commuting to Uptown by bike from Davidson, if you work in Davidson, you will probably be able to ride to work. This is one of the most bike-friendly neighborhoods in the Charlotte area and offers a very attractive downtown with plenty of bike lanes throughout. Bike riders also enjoy the Davidson Greenway, which covers a total of six miles and runs through downtown. While South Boulevard isn't the place for bicyclists, the Charlotte Rail Trail makes the South End a very bike-friendly neighborhood in Charlotte. It's a trail that is still growing and goes along the light rail tracks. You're even allowed to take your bike onto the LYNX light rail if you want to get to Uptown or even to South Charlotte. You're going to work for who? Never heard of them. There is no way they can offer what we do. We aren't perfect but we are better than the other firms. Aren't you afraid your clients won't like working with a small brand? 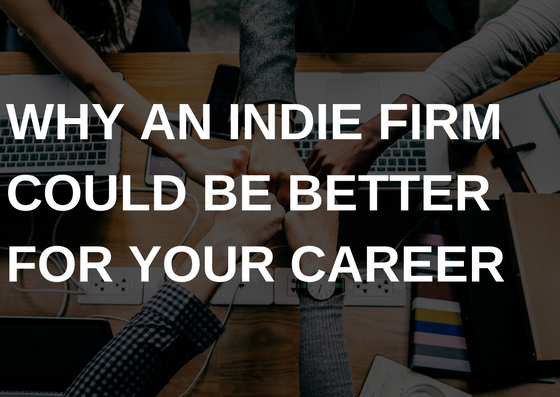 These thoughts filled my mind when my Broker-In-Charge, mentor, and friend that was a rock star agent left for an indie brokerage that no one had heard of at that time. Have you ever really considered a world outside of a big box firm? If not, I can understand. That was my story for most of my career. You see, I began my career at a big box brokerage in Northern VA at the age of 23 sitting behind an office computer trying to help renters on Craigslist find homes. I didn't interview other firms. Why would I? I liked being apart of the big box brand. It felt great telling people I worked there. However, I was new, not producing, and overlooked. Just before I died the new agent death I was lucky enough to connect with an indie firm, that had just partnered with a big box brand. This indie firm was new to the big box world so they still operated like a smaller shop. Culture is king for me so I was all in. I hung around the office just to be around the team. We were innovative, ridiculously collaborative, we had face-to-face training and not only what I call informational sessions. We worked our butts off and only hired the right people who fit the culture. How's Life When Living in a Charlotte Active Adult Community? An active adult community in Charlotte is exactly what it sounds like. It's meant for those ages 55 and older looking to live in a community with other adults and stay active. Often, these communities are packed with great amenities and right now, they are booming all throughout Charlotte. The benefits of buying a house in a 55+ community in Charlotte are endless. These master-planned communities come with several amenities, neighbors just like you and no children waking you up early in the day or hogging your amenities. Let's take a closer look at how your life will be if you choose to buy a home in a Charlotte active adult community. The community will easily define the lifestyle for you. Homes are moderately-priced, found in great locations and offer a desirable lifestyle. You will know by the theme of the 55+ community what you're getting into. Some will cater to even older seniors, while others cater to golfers or equestrians. The neighborhood mission statement will tell you plenty, as well. You may find 55+ communities with a mission statement to remain eco-friendly or to keep a tight-knit community. Regardless of the mission, the lifestyle will be well-defined and easy to figure out. While the point of 55+ communities is to only attract adults to own the homes, there are several types of active adult communities with different rules. It's important to know that most people over 55 years of age will have children and children that will come to visit. There may be restrictions on how long they can visit and some may not allow overnight children, but there will be children in the community. What Should You Do After Closing? You've gone through the home search process, settled on the perfect house and the seller accepted your offer. Closing day is coming and it's an exciting time. Are you prepared and do you know what to do after closing? While the home buying process can be stressful, exciting and a whirlwind of emotion, when it all comes to an end and you close on your new home; you may not know what to do. Here are some of the things you need to deal with after you close. Moving isn't always fun, even if you love the idea of moving to a new city or home. It's stressful and filled with exhausting tasks. Whether you hire a moving company to help or you plan to handle it yourself, you have a big job ahead of you. The job gets even bigger if you're moving with pets, children or both. You will need to take some time to make sure your moving day is well planned and you're ready to go. Use checklists to help and label all boxes with the room they belong to and what's inside. If you're not sure how to handle a specific item, hire a professional or get online and get some advice. Make sure you plan for food on the day of moving and keep everybody hydrated. Give the kids a few tasks to handle to keep them busy and make sure the pets are comfortable throughout the move. The last thing you need is to get stuck in a home with no power. After closing, it's necessary to have the utilities switched into your name and it's best to do this before moving day. Moving into your new home in the dark won't be fun, so make sure you schedule the power, gas, water, internet and cable services ahead of time.